The Columbia Marriott welcomes you to South Carolina with stylish rooms, thoughtful amenities and warm, friendly service. 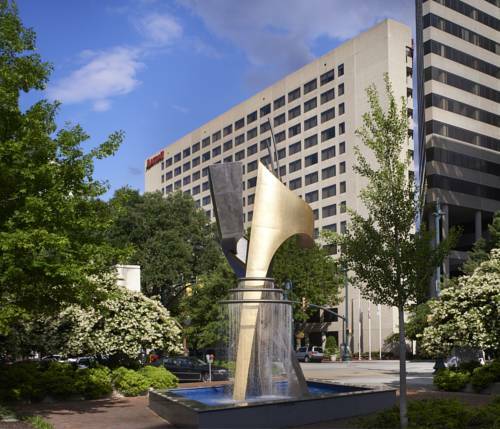 You'll find our hotel right in the heart of the city's vibrant downtown district, just moments away from the State House and the University of South Carolina. Settle in to your intuitively designed room or suite, which features pillowtop bedding with Frette linens, a well-lit workspace and free high-speed Wi-Fi access. Midlands', our hotel restaurant, offers new Southern cuisine and a heaping helping of Southern hospitality. Maintain your workout routine during your Columbia stay, thanks to our heated indoor pool and fitness center. Those planning events in town will be thrilled with our 27,000 square feet of flexible space, as well as our delicious catering services and prime downtown location. And we make it easy for you to explore; the Columbia Museum of Art, Riverbanks Zoo and Colonial Life Arena are well within your reach. Discover brilliant hotel travel here at the Columbia Marriott! Midlands', our hotel restaurant, serves flavorful New Southern fare and is open for breakfast, lunch and dinner. Fuel up for a busy day in downtown Columbia with a tasty morning meal, and be sure to sample our award-winning shrimp and grits at dinnertime. Toast a successful day in Columbia with us! Stop by for a cocktail and a light bite at our relaxed restaurant and lounge, which features plush sofas and chairs. Deceptively realistic highway tunnel entrance painted on the side of a building in 1975. < 1 mile from Columbia. Roughly the size of a home bathroom, in use until 1990. The Godfather of Soul, immortalized in bronze, with signature cape and microphone.